They will help keep the "common" Fairyland wildlife (i.e. Mice & Mallards) out of your Garden, thus increasing the chances of more interesting wildlife visiting. » For a quick find click Ctrl+F and type the name of the plant you wish to see. Upon successfully growing and harvesting this Mushroom, an additional 5 sq ft of rainforest will be protected. It's the new mushroom available with a unique "talent" of attracting caterpillars. When Fully Grown it will attract all the caterpillars, but after becoming Ready For Harvest, it will lose its charm. It also has the capability of deterring Common Wildlife and Mythological Wildlife, but only for a little while, during its Fully Grown phase. Supershrooms are the only Magical Mushroom to have a 100% deterrent effect on Mice, Mallards and all Mythological wildlife while fully grown! Anyone can plant Supershrooms, regardless of your Wildlife Level, however you need to earn them by collecting either 'Forest Amber' or 'Forest Sunlight' Jewel Seeds (these are dropped by many easy-to-spot types of Fairyland wildlife - see the Wildlife Guide for details). This mushroom has 4 different looks when fully grown and Ready for harvest. Upon successfully harvesting this plant, an additional 5 sq ft of rainforest will be protected. The Enchanted Magical Mushrooms section is a secret one and you can unlock it after you have reached Legendary II wildlife level, that means that you have to earn 10.000 diamonds from spotting/attracting wildlife! 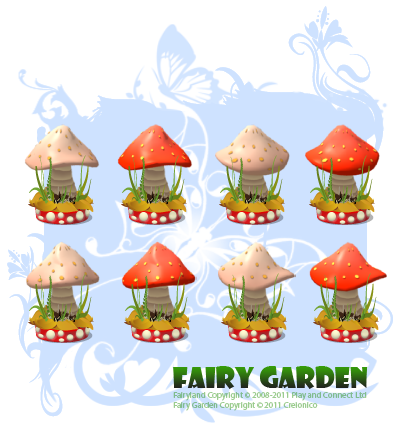 Ye Olde Fairyland Shoppe is introducing some new Enchanted mushrooms over the coming months for Gardeners who wish to continue onwards and upwards by achieving complete new Wildlife Levels beyond Legendary! More Enchanted Mushrooms will be arriving over the coming months! Upon successfully growing and harvesting this Mushroom, an additional 10 sq ft of rainforest will be protected. Upon successfully harvesting this plant, an additional 10 sq ft of rainforest will be protected.